Book cover commission for Zinc, who is writing a book which includes (non-Virmir-canon) Virmirs, but doesn\'t know the title yet so I just made one up. Working on a Crimson Flag book and obviously need to include the obligatory world map. This is looking really good Virmir! So, I\'ve been playing Pokemon Platinum. Cost me an arm, too. 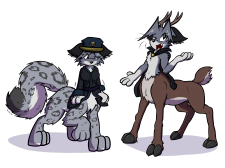 So, we\'re having a taur problem. I wrote this relatively simple idea out and accidentally made it 18 pages. The first course of action whenever experiencing any sort of transformational anomaly is finding somewhere out of public. Always check the scouter first. It\'s just an explosion. Nothing to see here, really. Inns are good places to deal with transformational curses, right?